PRESERVE OUR WRECKS, KINGSTON was featured on the Discovery Channel's Daily Planet last week. INADEQUACY of Wind Turbine Noise Regulations and their Application is an interesting paper recently presented by Queen's University Physics professor John P Harrison to the Annual Conference of the Canadian Acoustics Association. It's an interesting technical read. As you go through it, keep in mind that the Wolfe Island Wind Farm's minimum setback is only 400m. The Ontario Government, in its recent Green Energy Act has proposed a minimum 550-metre setback from residences for wind projects involving five or fewer turbines, with greater setbacks -- up to 1,000 metres -- for projects of more than eight turbines. Wolfe Island has 86 turbines. Wolfe Island falls ridiculously short of the Ontario government's own proposed health and safety guidelines for wind industry development. History already shows that Wolfe Island was a development pushover. Island leaders have a lot to answer for. And who was the Provincial Minister responsible for this? That would be Kingston's own John Gerretsen, Minister of the Environment. We've been pwned by our own. FISHING FOR ANSWERS OFF KINGSTON'S SHORES in today's Whig, about an ongoing geophysical survey of Charity Shoal, thought to be a meteor impact crater. One-mile diameter Charity Shoal is 11-miles due South of Portsmouth Olympic Harbour. Most of the crater is in Canadian waters. THE FINAL CONCEPT PLAN for Lake Ontario Park has been posted in the City's Arts, Recreation & Community Policies Committee agenda for its October 22 meeting. MARINE MUSEUM DRYDOCK finally gets between $2M and $5M for drydock repairs. Work may start before year-end, according to The Whig. The OCTOBER EDITION of the Thousand Islands Life e-zine is out. Local interest articles include Howe Island Vines on local grape-growing, A Muskie Jake Tribute about Clarence (Muskie Jake) Huntley who passed away last year, and a Brian Johnson article titled Silent Rapids of Long Sault. Also interesting is Pauls Legacy, Judys Gift, TI Gold about what's become of the late Paul Malo's extensive archives. THE EARLY FORECAST for next spring indicates lower-than-average levels for Lake Ontario. Bear in mind this is the fourth year in a row that early forecasts predict low-water and it hasn't turned-out that way come springtime. HOW TO RUN A RAILROAD, Kingston-style. You require people to register 3-weeks in advance (deadline Nov. 7th) for Saturday Nov 28th information sessions about the so-called third-crossing of the Cataraqui River. THREE NOTABLE ITEMS on City Council's agenda for the meeting of October 6 2009. Read the Recreation & Leisure Services Department 2009-2010 Priorities and observe the degree to which waterfront just isn't on the radar. What's waterfront-related is either stalled, or token. "Design of the Breakwater beach area (2010)". The Mass Swim, the culmination of public disgust over how our waterfront is marginalized, was held July 22nd 2008. "Window repairs at the Richardson Beach Bath house (2010)". That's routine deferred maintenance, long overdue, masquerading as a listable project serving the illusion of serving the waterfront. "Final approval to the Lake Ontario Park Plan (November 2009)", the proximity of which signals that public outcry (also here) over the way overblown concept plan will be mostly ignored. "Marinas Business Plan (February 2010)" which promises to be an eyeball-roller given all the evident shenanigans (and here) leading to that. "Waterfront Plan (2010)", whatever that is. This is bundled with, and listed after items like "New outdoor rinks construction policy (2010)", "healthy food options (2010)", "Community gardens policy (November 200)", and "Sustainable food strategy (2010)". That's your Harvey-Rosen-era Kingston waterfront, right there. The City gets, gratis, a narrow-strip of adjacent land to allow widening the waterfront pathway between the West Street launch ramp and Simcoe Street. That's courtesy of Holmstead Land Holdings which, rest assured, will get-that-back in spades later. The 2006 agreement with the Kingston Brewing Company to operate 6 Clarence Street as a service centre for Confederation Basin Marina boaters is renewed and sweetened through 2012. METALCRAFT reports that the FireStorm-69 fireboat they've been building for Tampa Fire Rescue has arrived. 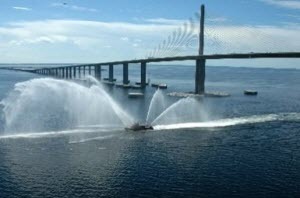 Evidently it was an impressive sight under the Sunshine Skyway bridge. Prior to arrival, the delivery crew spent an unscheduled night on a shallow sandbar off St-Augustine, FL. See the MetalCraft news item for a photo and a link to a very good YouTube video of the haul-off spectacle during the following morning's rising-tide.